Secured credit cards require a deposit, and can help build credit by reporting your activity to major credit bureaus. Browse the best secured credit card offers from our partners, apply for the card that suits you, make payments on time, and keep a low balance to help improve your credit. Flexible credit line - the amount of your deposit determines your initial credit line - up to $3,000 and increase your credit line anytime with additional deposits. If your credit isn't its best or you are new to credit, your options can be limited. In fact, the New York Federal Reserve reports that in October 2018, 21.2% consumers were rejected when applying for credit cards, up from 15.7% a year before. But with a secured card, you can build your credit in a few months so that you can apply for a more rewarding unsecured card. Secured cards require a refundable deposit that you are borrowing off of for your available credit limit. In many cases, they may be your only option. But they are a great way to build credit and to develop good payment habits. Do secured cards really help your credit? How much is a typical deposit on a secured credit card? Wondering how to get a secured card? Or not sure how to use one? We explain below. This card's travel and shopping benefits run the gamut, from extended warranty and price protection to auto rental insurance and travel accident insurance. Conveniently, there is no annual fee. There are no rewards, although that is to be expected of most secured credit cards. There is a high regular APR, so consumers should take care to pay their balance in full every month. Earn 2% back at gas stations and restaurants for up to $1,000 spend each quarter; plus, Discover will match your cash back at the end of your first year. With no annual fee and rewards to boot, this secured product offers another reason why it's a good card for the long haul – you have the opportunity to upgrade to an unsecured card after 8 months. There's a lot to love about this card, but the regular APR is not one of them. Higher than the average APR for credit cards, which is 17.67%, the Discover it Secured's variable APR is one of the highest among secured cards. "The Discover it Secured card is noteworthy because it offers rewards – a rarity among secured cards," says CreditCards.com Industry Analyst Ted Rossman. 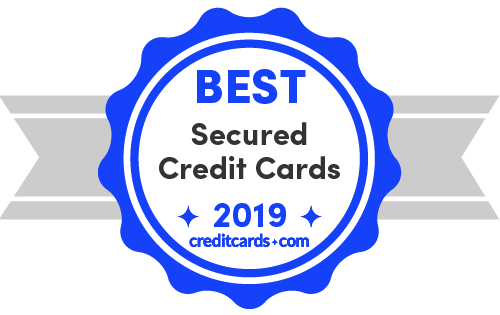 "With no annual fee and 2% cash back at restaurants and gas stations and 1% everywhere else, this card is a compelling introduction into the world of credit." This card's no annual fee and no foreign transaction fee make it a great starter card. The terms are fairly straightforward, and with responsible use, you could get a higher credit line in as soon as 5 months if you make your first 5 monthly payments on time. The Capital One Secured Mastercard offers no sign-up bonus or ongoing rewards. No credit check is required with the OpenSky Secured Visa, which is a rarity for credit cards. There's an annual fee, as well as fees for foreign transactions, inactivity and garnishment. This is a good way to build credit for someone with iffy credit. There's no hard pull on your credit, and it doesn't matter where your credit is when you begin. There's an "administrative fee" that is on a sliding scale, depending on how much you pay into your "account." So, if you pay $89 a month for 12 months, you pay a $12 administrative fee and you get $1,000 at the end of the year, $68 shy of what you've put in, bringing the total finance charge to $80. In addition to the requisite features of a card for credit building, this card also offers auto rental insurance and price protection, items more commonly affiliated with rewards cards. No minimum credit score is required, making the First Progress Platinum Prestige Mastercard Secured Credit Card a good choice for someone not sure about acceptance. You can get a credit limit of up to $2,000, which is high compared to most secured cards. No rewards, annual fee, foreign transaction fee – this First Progress product isn't oozing with pluses. This card has a new expedited processing option, which is handy if you are looking to get your new card quickly. Also, the First Progress Platinum Elite Mastercard Secured Credit Card doesn't require a minimum score or credit history. While not as bad as others, this card's fees can be onerous. As an unusual feature, the Green Dot primor Mastercard Gold Secured Card offers a fixed 9.99% APR, which is rock-bottom by any standards. Also, there's no minimum credit score standard, and even consumers with no credit history can apply. The cash advance APR is a bloated 18.99%, there's an annual fee of $49, as well as $29 for additional cards. Add to that, there are fees for everything from a credit limit increase fee to an automated account information fee. This card welcomes the consumer whose credit is in bad shape, as there is no minimum credit requirement. Credit lines can be up to $5,000, and there's a low fixed APR of 9.99%. This card's fees can nickel and dime you if you aren't careful – in addition to an annual fee, there's a replacement card fee, copying charges, credit limit increase fee and the list goes on. Similar to other First Progress secured credit cards, there is an expedited processing option that allows you to receive your new card sooner. No credit history is required to apply for this card, and the online application is relatively quick. The security deposit, which ranges between $200 and $2,000, and is fully refundable. Unfortunately, there is an annual fee of $39 in addition to some more obscure fees. What is a secured card and how do they work? A secured card is a credit card designed for a consumer with bad credit or a thin credit file. They require you to pay a refundable deposit, which secures your available credit. Because having a credit card is the easiest and fastest way to build credit, a secured card can be worth your while. What it is. A secured card is a credit card that requires a refundable deposit in exchange for a credit limit, typically $200 or more. Most credit cards are unsecured credit cards, which means a security deposit isn't required. What to watch for. Even if a secured card has no annual fee, you'll need to check for other kinds of fees, including late fees and returned payment fees. How to get approved. Check your credit score and the bank's requirements to make sure you are likely to be approved. What to do first. If you are approved, you'll be required to pay the refundable deposit. Then, you'll be approved for a credit limit, typically starting at $200. How to use it. Even if your credit limit is $500, that doesn't mean you should spend it. If you carry a balance of $250, that means your utilization ratio is 50% -- you want your ratio to be as close to zero as possible, for credit-building purposes. Also, you need to pay on time each month, again to ensure you are building your credit. Rinse and repeat. Check your credit score after several months and see if you qualify for a better card. Some cards, such as the Capital One Secured Mastercard, increase your credit limit after several months of on-time payments. For good measure, check your credit reports, as well, looking for errors or mistakes that need to be corrected. How do you use a secured card? You can use a secured credit card in the same way you use an unsecured card – simply present the card to the retailer to make a purchase, provided the merchant accepts the network displayed on the front of your card (Visa, Mastercard, American Express or Discover). You can use the card for all manner of purchases; to rent a car or hotel room; or even, in some cases, for rewards. This is perfect for traveling you need to do in 2019. However, because the credit limit is typically only several hundred dollars, it's worth your while to limit use of the card to one or two small purchases a month, then pay off the bill in full before the due date. This will allow you to build your credit more effectively by keeping your balance low compared to your available credit, called your utilization ratio. Because you don't know exactly when during the month that the card issuer will report your credit habits to the 3 credit bureaus, it's a good idea to pay in full several times a month, keeping the utilization ratio as low as possible. Create 3 reminders each month to ensure that you pay on time and often enough. Secured credit cards can help your credit, if you pay in full and on time each month and you make sure the issuing bank reports your credit habits to the 3 major credit bureaus. By paying in full and on time, you are building your credit history as well as improving 65% of your score with a single action. If you ensure that your credit habits are being reported, then you know that the credit bureaus have what they need to share with the credit score models and lenders. As you can see, everyday purchases lead the pack, even more than rewards, but almost a third of consumers are working to build their credit, something that secured cards are good for. Most secured cards give you a credit limit to match your security deposit, although the Capital One Secured card might give you a higher limit than your security deposit. The deposit is refundable once you close the account, and in some cases, after you've shown yourself to be credit-worthy, you can get your deposit back and also keep the card. Check your credit report. Review your credit reports for inaccuracies and get them corrected. Also, fix any unpaid charges so that they don't continue to build bad habits on your reports each month. Go to AnnualCreditReport.com for free reports from the 3 credit bureaus. Make 2019 your year for checking your credit reports regularly. Check your credit score. Before you apply for a credit card, check your credit score so you know what you qualify for. You can get your score for about $20 each through MyFICO.com. Check for surprise fees. You can quickly incur add-on fees through a starter card. Charges can be in embedded in the text of the rates and fees notice, so read carefully. Be honest. Don't lie on your application, because if caught, that's a sure-fire way to lose your account. Apply for one card at a time. Avoid applying for multiple cards at once. Each time you apply, your score takes a little hit, whether you get the card or not. Watch out for hidden fees. While some fees are clearly marked in the "Schumer Box" at the top of cards' rates and fees disclosures, lesser known fees with credit-builder cards can be mentioned lower in the copy. They can have vague descriptions, such as "copy fee" or "telephone payment fee," and can pile up fast. Heads up that while secured cards can have among the most fees, they can also have the least, as in the case of the Capital One Secured Mastercard, with only 2 fees. Is the interest rate high? If you plan to carry a balance, you'll want to avoid a card with high interest rates because the interest charges can pretty quickly overtake the principal when the rates are high. Don't become enamored with rewards. When you are trying to build credit, you want to pick a card with few fees and such features as an increase in available credit if your credit score increases, as in the case of Capital One Secured Mastercard. Rewards should not be a priority right now, because you are not going to be using the card for big charges. That said, think about how you might use the card down the line, because while you may not use a card's rewards today, they may be advantageous a year from now. Whether you don't want to plunk down a security deposit or you don't qualify for a secured card, there are a number of alternative ways to enjoy convenience, the safety of a cashless life and even credit building. Usually unsecured credit cards are for consumers with better credit, but there are some available for fair and even poor credit. However, they often have hidden, weird fees. That said, there are a few that are worth a look, such as the Discover it® Student Cash Back and the Discover it® Student chrome. Both have minimal fees and both offer rewards for restaurants, gas stations and more. Retail cards are often co-branded with a network, such as Visa or Mastercard, and they frequently only require fair credit. There is usually no security deposit required, but the APRs are typically higher than other credit cards. While you can't build credit with these cards, some people use them to manage their spending. Prepaid cards can be purchased at grocery and other stores, then reloaded with money when the balance runs low. Prepaid cards are safer than cash because they have some protections by federal law. Debit cards are attached to your checking or savings account and can be used at points of sale and as an ATM card. You won't be able to build credit with this kind of card, and you'll need to check your financial institution about protections, because they don't automatically have the protections of credit cards or prepaid cards. There are different types of credit-builder loans, including unsecured loans that can be used for emergencies, such as a car breakdown, and secured loans that require you to save. As the name implies, they are designed for building credit. Community banks and credit unions often offer these lending products. A passbook loan is a lending product secured by a savings account. According to Investopedia, some lenders lend up to 50% of the savings account balance while others lend up to 100%. You can earn interest on the account, including the amount borrowed. A secured credit card is an excellent financial product for building credit when your credit hasn't been its best. But eventually, you want to work toward an unsecured card, because options open up for you including superior rewards and benefits. Unsecured cards often come in the form of a rewards card, one of the favorite types of cards for consumers. There are airline cards, general purpose products, hotel cards – all of these can deliver benefits that make upgrading your card worthwhile. By upgrading to an unsecured card, you also have access to excellent balance transfer cards, luxury cards, and other products just not available as secured cards. So, what's your first step? It all has to do with your determination to improve your credit, thereby improving to a better card. With on-time payments and low balances, you will improve your score in no time. Once your credit score is in a good place (at least 700 on a scale of 300-850), it's time to think about what to do next. Note that some cards, such as the Discover it Secured card, lets you transition to an unsecured card after a period of time, provided your payment habits are good. Check with your card issuer. Or ask if you can trade up, allowing you to keep your secured card's good credit history, but enjoy the benefits of an unsecured card. Heads up that you likely won't be able to benefit from the new card as a new member, meaning you may not get such pluses as the sign-up bonus. However, you will benefit from any ongoing rewards that the new card offers. If you don't qualify for an upgrade or there is a disadvantage to the new card, such as an annual fee you don't relish paying, hang up and start doing your research – it's time to look at cards that best suit your lifestyle. Once you find the unsecured card of your dreams, it's time to look at whether to keep the secured card. However, only close it if there is a compelling reason, such as recurring fees that you want to break away from. Be mindful that when you close a card account, while your good payment habits don't drop off your credit reports for 10 years, the average age of your cards will go down. How do you avoid credit card debt? A few bad habits can make your experience with a credit card the worst ever. Carrying a balance, paying interest – these 2 habits alone can send you running from cards forever. In our January long-term debt poll, we found that 56% of card debtors have had card debt for at least a year. Let's turn that into dollars and cents: A balance of $1,000 with minimum payments made and a 17% interest rate means it will take you 57 months to pay it back and you will pay $451.55 in interest. That's almost half of the original debt. If you are not a high wage earner, you are more likely to owe – 66% of cardholders with annual household incomes of less than $40,000 are carrying card debt, our study shows, compared to 53% of cardholders with household incomes of $80,000 or more. That doesn't mean you can't break the mold, though. It all starts with a budget. By creating a brutally honest budget (track every item) and including money for fun and emergencies, it's possible to thrive with a credit card. Review your budget every month and adjust it. One final thought: Our poll shows that it's everyday items such as groceries and child care that are most likely to land us in card debt (28%). One easy way to avoid this is to make sure you are tracking card spending in a separate column from your checking account. Check your card account each weekend and note what you are spending for. Pay on time. While it takes months to build your credit with good payment habits, one or two late payments can cause a big drop in your score. And not only is paying on time good for your credit, it keeps you from having to pay late fees and even losing your card. Pay in full. In fact, pay multiple times a month to keep your utilization ratio low – because you don't know when your issuer will send your account information to the 3 major credit bureaus. This will also help you avoid interest charges. Place a small charge on the card. Don't forget to use the card each month. If you lose your card to inactivity, you can't build credit month by month. Put a recurring reminder on your calendar to ensure that you don't forget. Or better yet, place an auto debit for a small charge on your card.